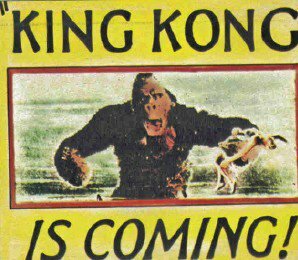 John Kenneth Muir's Reflections on Cult Movies and Classic TV: King Kong is HERE! King Kong opens today, and I'm just about as excited as a fan boy can be. I grew up with the 1976 film -- so I love that version dearly (and you can read my spirited defense of it, here.) But I also love the 1933 classic, one of the greatest masterpieces in a hundred years of cinema. I have done interviews with literally hundreds of talents in Hollywood in my writing career, and I can tell you with certainty, more people pursued the vocation of filmmaking because of their love of King Kong than just about any other film in history. "truly brilliant, beyond the amazing dinosaur battles and disgusting giant bugs and the monkey on the Empire State Building and all - It's about the primal force that is entertainment, how it speaks to us and moves and connects us when it's real." Roger Ebert awards the film four stars noting that it is "magnificent entertainment." He also calls the new Kong "one of the great modern epics" and "one of the year's best films." A dissenting voice comes from the Charlotte Observer's Lawrence Toppman. His review is titled "Great Ape, Fumbled Movie." He writes that Jackson's Kong is "a labor of love that's visually stunning and moving in its best moments," but also that it's "bloated, shallow, clunky, full of illogical scenes and at least an hour too long."